The Pixel XL features 2016's top-of-the-line specs and is a fine vessel for Android Oreo. This VR-capable phone has a suitably fast processor, even by 2018 standards, and a superb camera, all sandwiched into a funky design. The Google Pixel XL, along with the Google Pixel, are the first phones 'made [almost entirely] by Google', and it’s the best way to experience the latest and greatest that Android software has to offer. It puts the immense power of Google search behind everything you do with the all-new Google Assistant, a context-understanding AI that’s often smarter than Siri and Cortana. Sorry, Apple and Microsoft fans. The Pixel XL launched with Android 7.1 Nougat, and currently runs Android Oreo. 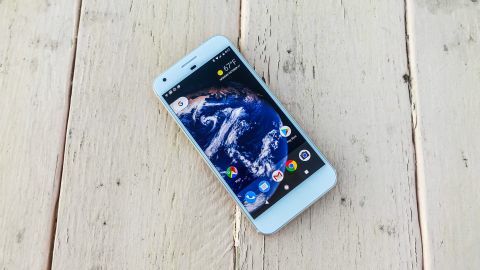 Along with the other Pixel phones, it will receive the update to Android P – its last major software upgrade. Going with that latest and greatest theme, it was also the first phone to get Google Daydream View VR headset powers. Even if you’re not into VR, this means you're getting top-of-the-line specs good enough for power-hungry gamers, and that’s fantastic news for anyone who wants a fast phone years down the road – yes, even with the Google Pixel 2 out in the world. The phone debuts the Snapdragon 821 chipset, with 4GB of RAM inside of a glass-and-metal body that's half-iPhone 7, half Samsung. The camera is touted as 'best in class', and the 5.5-inch Quad HD screen looks superb. Google is ditching its affordable, developer-focused Nexus brand in favor of the Pixel XL and its smaller 5-inch Google Pixel counterpart. This makes these new handsets more expensive, but they also showcase greater ambition on Google's part. Update: Google has delisted the Google Pixel XL from its online store, thus officially dropping the curtain on the first-gen phone. It's still possible to find at several retailers, but it could become difficult (and more expensive) to find if you're after a cheaper Google phone. The price gap between Google's first-gen XL device and the new Google Pixel 2 XL, so far, hasn't been that wide. Thus, purchasing the former over the latter simply couldn't be recommended. But as time goes by, the decision will become easier. Why? Well, the prices are getting better for the Pixel XL – lower than they've ever been. While price varies for the original Pixel, you won't see as much fluidity just yet for the Google Pixel 2. It just released in October 2017, so expect to wait another handful of months before big deals show up. That said, here's a look at the very best values for Google's latest phone. Believe it or not, the Google Pixel XL is still tough to find in stock. The official Google store has you join a vague waitlist, but you shouldn't have much of an issue scoping out a deal on sites like eBay or Amazon. Launching at $769 (£719, AU$1,269) for the 32GB version, and $869 (£819, AU$1,419) for the 128GB model, each iteration is now going for $100 less. It’s Google’s smartphone all grown up and that means it’s more expensive than the now discontinued Nexus 6P. There’s also no 64GB in-between internal storage size, and no microSD slot for expandable storage to make 32GB more tolerable. You have to go big if you're recording a lot of high-resolution video. You have better shot at finding Google Pixel XL in stock at a carrier store. Verizon sells it on contract, and it's available right now in the US. It costs $32.08 a month over 24 months and comes with day one updates. Or, you can skip the contract and pay everything up front for the SIM-free Pixel XL. It works just as well on AT&T, T-Mobile and Sprint in addition to Verizon thanks to having both GSM and CDMA antennas. In the UK, you can get the Pixel on contract from EE, paying £9.99 upfront and then £55.99 per month for 10GB of data and unlimited calls and texts. Google called the Pixel XL design 'bold' during its initial announcement, noting that the back of the phone’s glass-and-metal makeup gives it “personality and character." If that sounds like a backhanded compliment, it’s kind of deserved. It’s almost as if Google heard that people like metal phones, but also like glass phones, so it decided to throw in both materials. It’s an odd, two-toned mix on the back side, making the Google Pixel XL feel like we’re one step away from unwrapping the Neapolitan ice cream of smartphones. It does have rather thick bezel at the top and bottom, despite having no physical home button at the bottom. It looked okay at launch, but 2017's trend of slim bezels proved that this look is getting a little long in the tooth. The odd, two-toned mix on the back side makes it feel like we’re one step away from unwrapping the Neapolitan ice cream of smartphones. The good news is that, as funky as it looks, the materials are solid: strengthened Gorilla Glass 4 for the top third around the rear fingerprint sensor and camera, and polished anodized aluminum on the bottom two-thirds where your hand wraps around the phone. Clutching this phablet shouldn’t be a problem if you could get the taller Nexus 6P in your hands. It measures 153 x 76 x 8.58mm, and tapers off to a depth of 7.31mm around the back. It’s slightly thicker and boxier than most phones, including the iPhone 7 Plus at 7.3mm, but not quite as tall or, more importantly, wide. Normal-sized hands will do okay here. Google has thrown a lot into the Pixel XL design, but there’s one thing you won’t find: an annoying camera bump. The rear camera is completely flush with the glass plate on the back, a design feat that Apple and Samsung have yet to achieve. Unfortunately, the Google Pixel XL doesn’t live up to those manufacturers' waterproofing standards. Its IP53 rating means you can’t get this one wet, never mind accidentally dunk it in the sink, pool or toilet. That's a deal breaker for the clumsy among us. On the front, surrounding the 5.5-inch display is a rather big 'chin' for a phone that contains no physical home button. All of the face buttons are on-screen, while the riveted sleep/wake button and smooth volume rocker are on the right side. It does, however, use that extra room at the top to include a headphone jack. There’s a speaker on the bottom, but while there are two speaker grilles, there’s just one firing out sound. If you accidentally cover it up with your finger (which happens a lot when playing games and watching movies), it kills the volume. It's extremely easy to do holding the phone in landscape mode. Showing that it does, in fact, have 'personality', the Google Pixel XL colors include Very Silver, Quite Black and Really Blue, a poke at ridiculous phone-color naming conventions. Really Blue, a limited-edition and, so far, US-only Google Pixel color, sold out within hours of the pre-order launch. Thankfully, Google promised to restock it and it did on December 1. It's not that limited. You may have to join a wait list, depending on your phone configuration of choice. You’re probably going to get a Live Case to cover up the peculiar glass-and-metal design anyway, so if you can do without a water-resistant phone and stereo speakers, you’ll be fine. The Google Pixel XL further proves why AMOLED displays look the best for smartphones, thanks to its colorful and bright screen that outclasses LCD panels every time. It’s vivid and ready for virtual reality on a budget, the latter being one key reason we’d suggest you upgrade from the normal-sized, 1080p Google Pixel. If you're into VR, big phones and more battery life, this one's for you. If not, save your money. The screen looks better than an iPhone 7 Plus, but it’s missing one key feature we like about Apple’s display and newer Samsung and LG handsets: a rise-to-wake or always-on screen. Having to reach for the tiny, side-mounted sleep/wake button on this phone just to light up the lock screen made us miss this informative display feature. The rear fingerprint sensor pad (not a button) lights up and unlocks the phone with authentication, too, but that's only useful when it's in your hand, not sitting on a desk. At least give up a double-tap-wake feature to light up the lockscreen. An Ambient Display modes does lights the screen up in a black-and-white color palette when notifications come in, but it’s just not the same. Google has finally upgraded its new phone to include a Night Light mode that matches the iOS 9.3 feature. It lacks the adjustable orange-to-blue levels Apple has had from the beginning, and turns from blue to orange rather abruptly at sunset, but it’s a start.